The sky was gray, a light snow fell, and the weather was bitingly cold. But the mood outside New York’s John F. Kennedy Airport (JFK) on Saturday was red-hot with anger, as dozens, and then hundreds, and then, as night fell, thousands arrived to protest President Donald Trump’s executive order barring entry into the United States of all refugees—including Syrian refugees, perhaps indefinitely—as well as visa-holders from seven Muslim-majority countries. The rally, organized by a coalition of groups including the New York Immigration Coalition, the Arab American Association of New York, and Make the Road New York, came together within hours. The call for a rapid-response demonstration was posted on Facebook in the morning, and word quickly spread on social media. Supporters of these groups came from across New York, traveling long distances on the subway to reach an airport not easily accessible for many. Throughout the day, the protesters huddled in a holding pen outside Terminal 4, the part of the airport where refugees and visa-holders, turned back from the United States, were being detained. They chanted, “Love, not hate, makes America great,” and “No hate, no fear, Syrians are welcome here,” as cars driving by honked their horns in support. Inside the airport terminals, lawyers whipped out laptops to draft habeas corpus petitions to get their clients, held by Customs and Border Protection agents, out of detention. Meanwhile, Port Authority police officers milled on the perimeter, and also blocked protesters’ entrance into Terminal 4. As the crowd grew, the demonstrators eventually spilled into the parking terminal overlooking the main protest area. The protests lasted well into the evening, and continued as a federal judge ruled to temporarily halt part of Trump’s executive order in response to an American Civil Liberties Union lawsuit. The order applies only to those who arrived in the United States with valid visas in the past 24 hours but were detained upon entry; they cannot be deported for now. While the order is temporary, it is a partial victory for civil-liberties advocates. Trump’s order to bar refugees and many Middle Easterners, signed on the Friday afternoon of International Holocaust Remembrance Day, was a stunning capstone to a stunning week that seemed designed to shock Americans into submission. 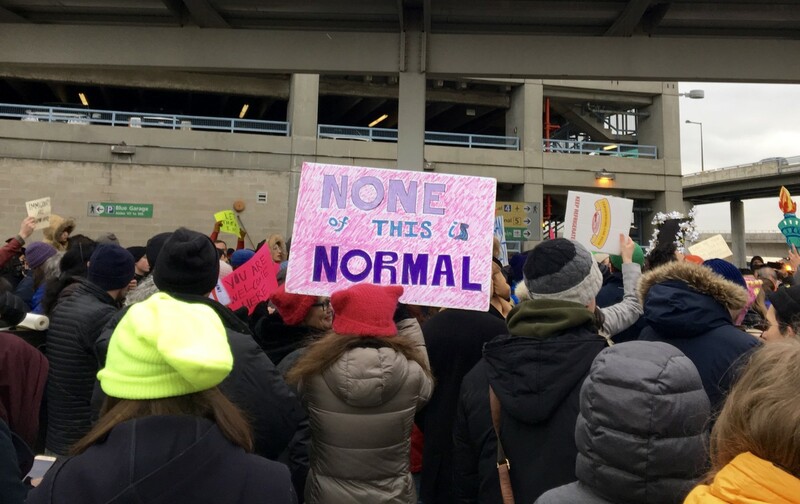 But in New York, and in cities around the country, protesters poured into airports in droves, determined to help those locked inside airport detention centers who had arrived just after Trump issued the ban. Taxi drivers called for a work stoppage outside JFK. Demonstrations were held in Chicago, Boston, Newark, Los Angeles, San Francisco, and other cities. Fahd Ahmed, the executive director of the South Asian–led group Desis Rising Up and Moving (DRUM), told The Nation he feared that the current order was a test run for an expanded order down the road, perhaps targeting citizens of more countries. In addition to the denials of entry and detentions, he had heard that Muslim travelers were being harassed and harshly interrogated by US officials at airport entry points around the nation. “What’s becoming clear is that this [order] is not just a bad, misguided policy. The current administration has a larger ideology, viewpoint and platform—a platform of white supremacy against Muslims, immigrants, and refugees,” said Ahmed, whose group has been helping lead resistance against Trump’s anti-immigrant policies. The urgency—and fluidity—of the moment was underscored in the early afternoon, when lawyers, helped by Representatives Jerry Nadler and Nydia Velasquez, both of New York, successfully freed Hameed Darweesh, an Iraqi refugee who has worked for the US military. Darweesh had been detained for hours before the American Civil Liberties Union filed legal action on his behalf. But the sense of victory quickly turned sour as other Muslim travelers were not released but remained in detention inside. Protesters vowed to remain outside JFK until everybody was free, and supporters of refugees also gathered inside a federal courthouse in Manhattan for a hearing on whether detainees would be able to stay in the United States. A few hours later, at least one other Iraqi refugee who also worked for the US military, Haider Alshawi, was released after being detained for 24 hours. Alshawi was one of unknown numbers of refugees and visa holders detained in airports or turned back before hopping on a plane to the United States. Inside JFK, there were at least 11 people detained, according to Murad Awawdeh, the political director of the New York Immigration Coalition, the group that hastily organized the protest. As the day wore on, the full scope of Trump’s order began to come into focus. The text of the order temporarily halts refugee resettlement; indefinitely bars all Syrian refugees; and, for 90 days, blocks travelers coming from Iraq, Iran, Sudan, Yemen, Somalia, Syria and Libya. But there was confusion as to how it might impact dual-nationals and green-card holders. By the afternoon, the word from the White House had come down: Green-card holders could enter, but only if they receive an individual waiver. The State Department said dual citizens—for instance, someone with British and Iraqi citizenship—would be barred from entering the United States for now. And in New York, Congresswoman Velasquez forcefully spoke out against the refugee ban. As protesters chanted, “No ban, no wall, Donald Trump has got to fall,” The Nation spoke with Aditi Niak, who is from India, but received American citizenship last April.